Water Cooler W/HydroBoost Water Refilling Station, Light Gray by Halsey Taylor at Friv 4 Friv . MPN: HTHB-HAC8PV-NF. Hurry! Limited time offer. Offer valid only while supplies last. The Halsey Taylor HTHB-HAC8 HYDROBOOST Bottle Filling Station is a self-contained, wall-mounted, single unit that delivers chilled drinking water. 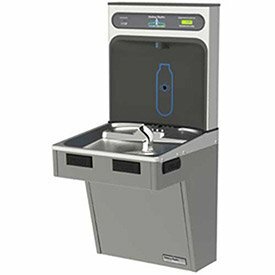 The Halsey Taylor HTHB-HAC8 HYDROBOOST Bottle Filling Station is a self-contained, wall-mounted, single unit that delivers chilled drinking water. Exclusive one-piece, chrome-plated twostream Double Bubblera,, with non-removable anti-squirt feature and integral hood. Automatic stream height regulator is located inside unit to prevent tampering. A constant stream height is automatically maintained under line pressures that vary from 20 to 105 psi. Includes self-closing, light touch front and side pushbar actuation with raised letters for the visually impaired. Non-corrosive Type 300 series stainless steel cooler top with satin finish resists stains. Basin includes anti-splash ridge and contoured to insure proper drainage. Includes Halsey Taylor's very popular HydroBoost automatic bottle filling station for quick, cold, water on the go. Superior laminar flow on bottle filler and patented Halsey Taylor anti-squirt double bubbler keep water where it's supposed to be, not splashed around on floor presenting hazard. Automatic water shut off on bottle filler once bottle is removed, or if there's an obstruction in front of sensor. Includes self-closing, light touch front and side pushbar actuation with raised letters for the visually impaired. Type 300 series stainless steel top, with satin finish resists stains. Anti-splash ridge reduces splatter. If you have any questions about this product by Halsey Taylor, contact us by completing and submitting the form below. If you are looking for a specif part number, please include it with your message.